Monarch southpaw quarterback Walker Heard (2) attempts a pass against Olentangy Liberty. Marysville will host Grove City on Friday. The Marysville Monarchs return home for this Friday’s varsity football game. The Monarchs (1-2) will be looking to snap a two-game losing streak when they host a Grove City squad that is still looking for its first victory of the season. The Greyhounds will run the spread offense and want to establish the running game. Their top two running backs, D.J. Gatewood and Nate Maynard, are described as “shifty” by MHS head coach Brent Johnson. 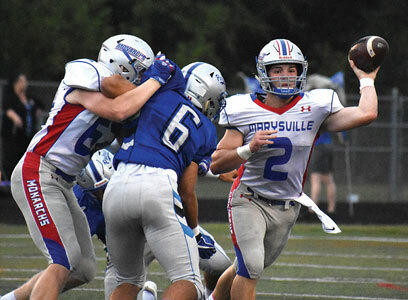 While Grove City looks to keep approximately 60 percent of its plays on the ground, quarterback Nate Bolin, a sophomore southpaw, can throw if needed. Johnson said the Hounds’ offensive line is solid, but feels his squad can match up with them. Grove City has shown both 4-3 and 3-4 defensive alignments during their first three games. Johnson thinks the Monarchs will see the latter set-up. Johnson, however, said MHS must be more concerned about what it does offensively than what the Greyhounds’ defense will present. “We have to worry about ourselves,” he said. “We had five of our seven penalties on offense last week against Olentangy Liberty. We can’t have that if we want to stay on schedule. Although the Monarchs have dropped two consecutive games, Johnson said they haven’t lost their focus. “They’re in tune right now,” he said. “They realize that a lot of our problems have been self-inflicted and they want to get back on track. “We know that Grove City has circled this game on their schedule,” he said. “They are going to be ready to play. “We have to be consistent on offense and put drives together,” said Johnson. “Our defense also has to get off the field on third down.